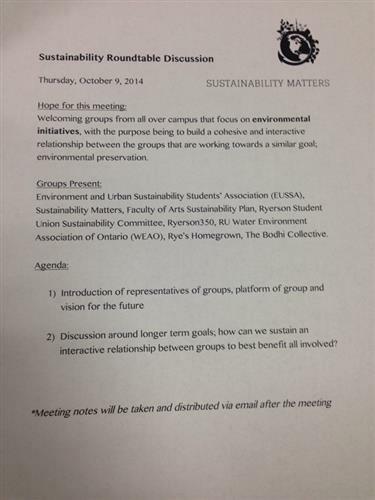 Ryerson campus groups are coming together tonight, October 9th, 2014 at 5 p.m. at the Sustainable Roundtable meeting to discuss how Ryerson can become a more sustainable campus.This event is hosted by the Campus Facilities and Sustainability (CF+S) office in collaboration with the EUSSA (Environment and Urban Sustainability Students' Association). The main objective of the event is to create an open discussion among interested community members and identify priority focuses for future campus plans.Tweet reporter Jean (@jeankodin) with your questions and comments. We will be starting the roundtable in a few minutes, waiting for a few more people to file in. 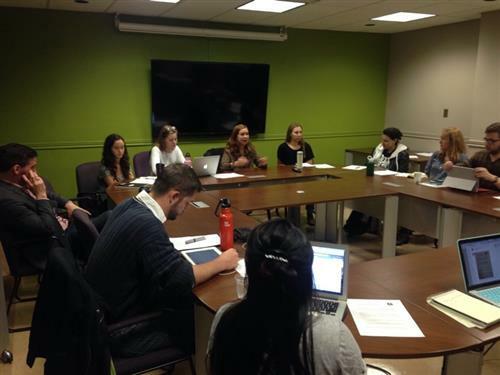 This roundtable meeting is hosted by the Environment and Urban Sustainability Students' Association (EUSSA) and Ryerson's Sustainability Matters program. The meeting will be facilitated by EUSSA president Claire Stevenson-Blythe. Here is a copy of this meeting's agenda. Audience, questions are welcome. EUSSA president Claire Stevenson-Blythe opens with introductions. She invites people to go around the room to introduce the campus groups being represented in this meeting. Stevenson-Bltyhe says EUSSA's main purpose is to represent the EUS program students but also connect further with the Toronto community. EUSSA team will be leading the discussions for this meeting. Faculty of Arts rep Jennifer Fisher introduces one of the main projects they are working on in the faculty. On Oct. 28, they are organizing a tree planting ceremony to create awareness on the health of our urban forest. Ryerson 350 representative, Kevin, talks about reaching out to the Ryerson students about the initiatives they want to work on. A closer look at the list of the groups being represented in this meeting. There are nine Ryerson campus groups, including Green Meeting Ninjas rep. James Watson, that are being represented during this meeting, but there are many that are not in attendance. James Watson of Green Meeting Ninjas has been working closely with different departments at Ryerson University to initiate more sustainable campus events. There are a wide range of focus areas being represented during this meeting, including water, homegrown agriculture, urban forestry and sustainable university operations. Stevenson-Blythe says that the bulk of the meeting will happen for the first hour, but they have the boardroom until 7pm. Stevenson-Blythe opens up the discussion with a brainstorm session on sustainability projects on campus. A main issue to be addressed will be how to engage with campus groups. They discuss ideas for solutions -- monthly meetings, a Facebook group, email subscriptions, a Google Drive? Ellen Pitt, Sustainability Matters website manager, says it's hard for us to reach out to every group. She says she feels like she hears about a new group every day. 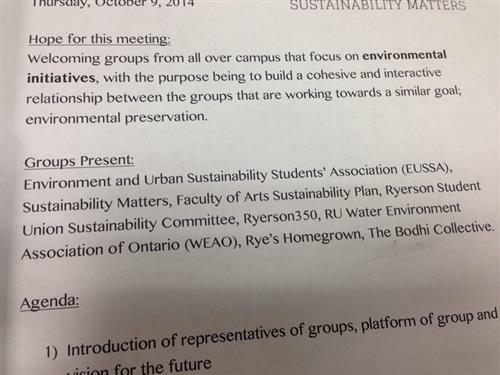 Randy S'ad from Sustainability Matters offers the Ryerson program as a possible solution. He says they are growing the ability and resources to do this. Pitt says it's important to maintain an ongoing relationship between groups to nurture engagement. Fischer says that it's great that we're taking this leadership, but we also need a larger group to unite it. S'ad says that this is definitely one of the functions that Sustainability Matters aims to have. The program is growing the aggregation, but it also it doesn't replace the conversation between the groups. Fisher asks is there a pool of resources or a body of mentors that we can access for these groups. 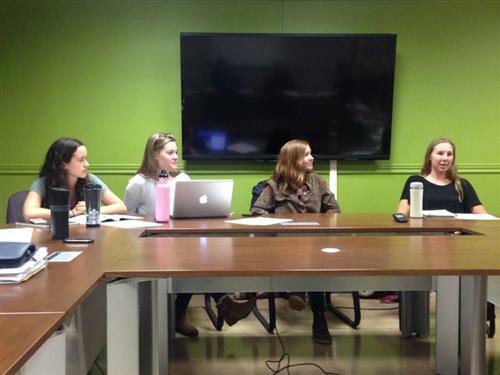 S'ad says that the kick-off meeting for Sustainability Champions across campus aims to fill that need. This is the discussion around the need to have a centralized body that will aggregate different initiatives across campus and have resources or act as mentors for these initiatives. RU Leaders representative looking for collaboration opportunities with other groups. Lynn from Bodhi Collective says there is a huge disconnect during these meetings in RU Leaders because there are a lot of lofty goals but there is no ownership beyond meeting discussions. Watson says those who are proposing these ideas should keep the ownership so that they can be responsible to put projects forward. Stevenson-Blythe puts forward for representatives to present some of the biggest challenges for their group. EUSSA's biggest challenge is that they have a lot of initiatives to organize, but turnout to these events and student engagement is always lacking. Watson suggests partnering with campus media groups to get wider promotion. Fischer proposes having joint events to have larger group turnout to events, especially in small events being planned. Ryerson 350 is planning to organize a workshop on Oct. 18 and are looking for space. Rye's Homegrown is also holding an event on October as well. 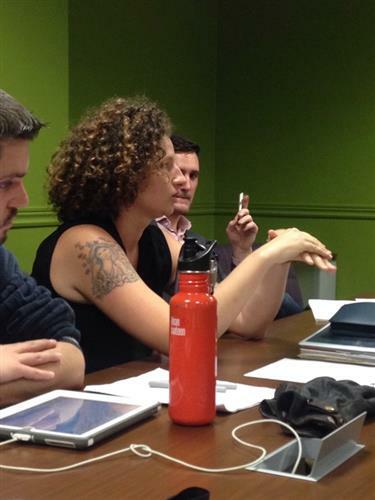 The roundtable is growing more animated about collaborating on upcoming events.